You think Singapore has nothing but skyscrapers ? Wrong !! Singapore’s climate allows great nature spots to survive in the midst of the city landscape… not only can you find vegetation on the side of the roads and many parks and forests in Singapore, but you can also occasionally bump into wild animals (not to worry, most of the time they are harmless !). So if you ever feel like you’ve had enough of the city, just grab a bus (or mrt) and go check some of these great places. And the best thing is, there are so many of them !! Click here to learn more. – The Botanic Garden : very famous must-do ! A beautiful garden where you can marvel at luxurious vegetation and trees that seem to reach our for the sky… Don’t forget to stop by the Orchid Garden, definitely worth a look. 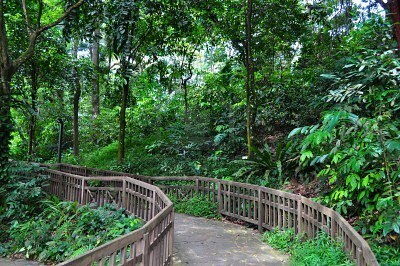 – MacRitchie Reservoir Park : perfect for a 2-3 hours walk in a forest, with a great treetop path to enjoy the view. 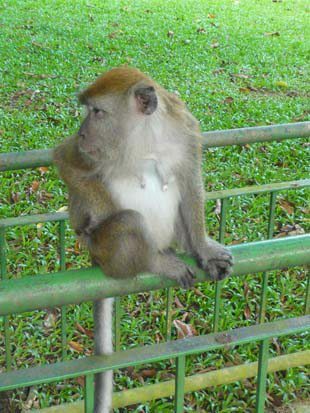 You might see quite a few monkeys there, as well as interesting birds and reptiles. Also, do not forget to bring a hat, an umbrella and a bottle water when trekking, as Singapore is hot and humid and we wouldn’t want you to dehydrate ! You wouldn’t believe the type of questions I sometimes get… so it’s time to set the answers straight !! 1. Is Singapore in China ? No !! Although you might have seen the word « Singapore » often associated to the Chinese community, Singapore is definitely NOT in China. It is an island city-state at the Southern End of the Malaysian Peninsula. 2. What language do people speak in Singapore ? Singaporean ? People who live in Singapore predominantly speak English. However, there are 4 official languages : English, Mandarin, Malay and Tamil. Also, according to their origins, people usually speak a few different dialects (Hokkien, Teo Chew, Hainanese…). Oh, and people “speak” Singlish too ! But more on that later. 3. What is Singapore’s population ? According to the 2010 census, there are around 5 million people in Singapore, including approximately 3,2 million Singaporean citizens, 500 000 Permanent Residents (PR), and 1,3 million non-residents (ie people who live, work and/or study in Singapore without being granted a permanent residency). 4. Are there buses and trains in Singapore ? Of course !! Do you think Singapore is still a fishermen’s village? Taking the bus remains the most convenient way of moving around Singapore, and the train (MRT – Mass Rapid Transit) is developing fast, with new lines opening (the last part of the Circle Line opened on Oct 8th 2011). 5. Is it true that you are not allowed to chew gum in Singapore ? Not really, you are allowed to chew gum on the streets. However, it is forbidden to sell chewing gum in Singapore (unless it is used for medical reasons). Try not to think of it as an unfair rule to prevent you from being free, but rather as any other rule created to keep the streets clean (like forbidding dog poo or spitting…! ).